A mixologist needs a place to store the tools and beverages that make cocktails. A cabinet or pantry will work, but a bar cart adds convenience and flair that’s hard to top. The bar cart is the perfect way to create the glamour of cocktail hour at home without the need for a built-in wet bar – a home design element that has gone by the wayside. Bar carts are not only functional; they add a fashion and design statement to a space that might have otherwise been overlooked or underutilized. If you don’t already own a cart, you can find classic ones at vintage and antique shops, or garage sales, and new ones online via a simple Google or Pinterest search. Once you have your cart, here are some suggestions to make sure it is well stocked. Everyone has their go-to spirit. 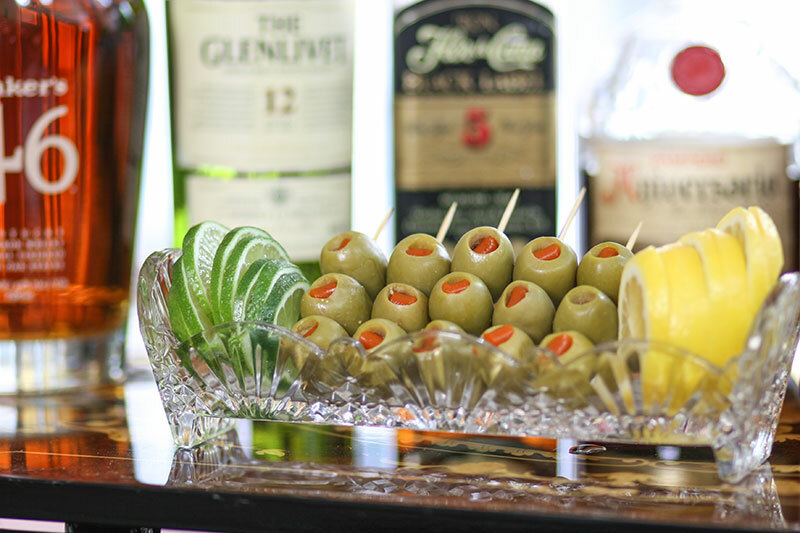 But the perfect bar cart includes items that help you AND your guests get into the spirit. Shopping at a destination liquor store, like Colonial, can be overwhelming – like being a kid in a candy store. But we’ve created a tool to help. Click here for your complete shopping list with both choice (budget conscious) and splurge options for all of the major categories. You don’t have to buy everything at once. Just check off the items when you purchase them and watch your bar cart become the ideal celebration station. For entertaining, a red and white option is essential. A good bottle of Champagne or Sparkling is always nice to have to celebrate any occasion. Colonial’s Wine Celebration Experts can recommend a large selection of wines in the Budget, Choice and Splurge range. Click here for ideas to set up a Champagne Bar. As with wine, keep it on hand if it is part of your daily happy hour and stock up if you are entertaining. Colonial’s Beer Celebration Experts are only too happy to recommend selections of craft, microbrews and imports that is second to none. Spirits are only part of the cocktail equation. Be sure to include these items in the mix. Bitters – Angustura Bitters are essential. There are many other flavors that make a great addition to your bar. Mixers – These include fruit juices, tonic and soda water. We recommend you have a few bottles of Fever Tree Tonic and Soda. Keep juices on hand only if they are an ingredient in your everyday cocktail hour, or when entertaining. 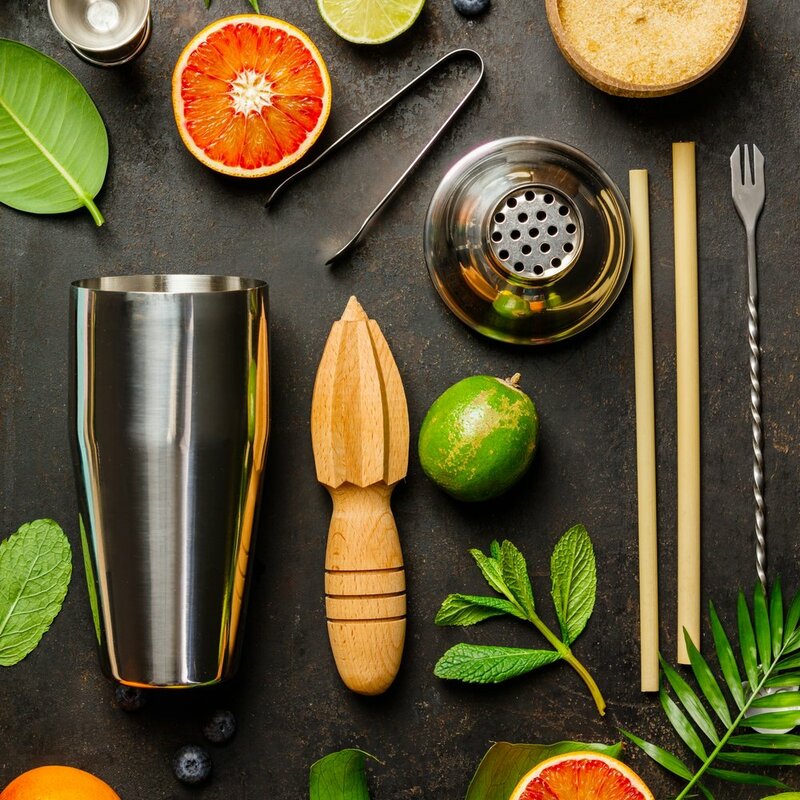 Garnish – Use the same rule as for Mixers. A good set of bar tools should cost from $50 up, according to assortment and quality. We cannot stress enough the value of quality glassware. A classic cocktail or fine wine does not belong in a red Solo cup. Here are the essential glasses you need. Highball: used for many cocktail recipes including the basic Rum and Coke, Scotch or Bourbon and Soda, Gin and Tonic, and Mojito. Martini: from classic to chocolate, a martini is the ultimate in cocktails and deserves the right glass. Snifter: for Cognac and also nice for Single Malt Scotch and Aged Bourbon. Rocks: for Manhattans and many other classic cocktails. Shot: Sometimes overlooked, but how are you going to shoot that Tequila on your bar cart without them. These should be of a good quality, but don’t have to break the bank. An entry level set of Riedel Overture glasses is around $85 and includes four each Red, White, and Champagne Flute. Cocktail glassware sets from Libbey and other manufacturers are very affordable, starting at $20 and up.